Spring and winter in the same week — heck, the same day. 1. Leaving for work in the morning and opening your door to this. 2. And then leaving work and looking out to this. 3. Commuters catching up on some light reading on the transit. 4. Weather reporters who won't let professionalism get in the way of their favourite holiday. 5. This inspiring sign downtown. 6. Circling around to find a good parking spot and — oh, a moose. 7. But fear not, Calgarians. Your police are patrolling those lots and protecting you by horse. 8. This fantastic driver caught on security camera. Calgary: What is happening allover your city's parking lots. 9. 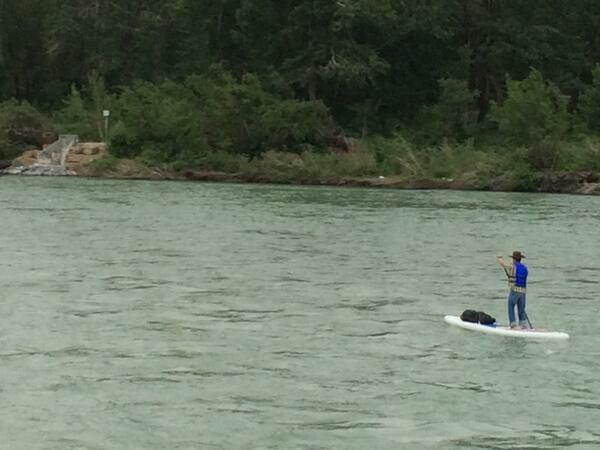 A cowboy on a paddleboard at 6am. A cowboy on a paddle board at 6:30am. Yup, must be #Stampede2014. 10. A real-time capsule sitting in the middle of a mall. It's only to be open in the year 2999. 12. Waiting for the bus after a nice spring shower. 13. Taking a pre-game hockey presentation to the next level. The Flames give a show in 3D. 3D. Watch the entire mesmerizing thing here. 14. The ever-so-slight climate changes within days. 15. Sometimes within the same day. And casually tweeting @ the city's leader: Meet the fearless mayor Nenshi.